At A1 Choice Plumbing & Drain in Kelowna, we know just how cold Canadian winters can be. That is why it’s very important that you maintain your furnace so your home will stay warm and comfortable until the warmer weather of spring arrives. The following are some steps you can take to ensure that your furnace is in working order. The instructions on how to re-light your furnace our usually printed on your furnace’s access doors. Typically the pilot light is in the bottom of the furnace and has a clear ‘On’ and ‘Off’ switch. Turn the knob off and wait for a minute until all the gas in the dissipates. Turn the knob back to the ‘Pilot’ setting and use a barbecue lighter to light the opening near the pilot while depressing the reset button. This will re-start the furnace automatically. 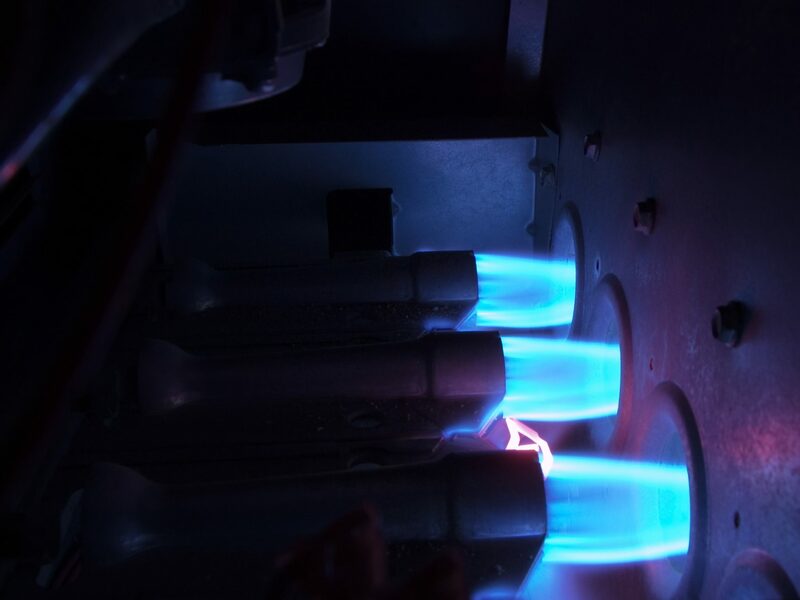 If you are having trouble re-lighting your pilot light, call a qualified heating professional. Check the furnace blower and make sure to remove any of the dust or debris that you find with a vacuum. The air filter should be replaced every 30 days, or as recommended for your specific furnace. If your filter is dirty it can block air flow and cause your equipment to overwork. It is important to check both the shield and the burner for rust and corrosion. Rust can occur on a gas furnace because of the reaction of combustion fumes on the metal parts. If you see rust, it is an indication that your furnace may not be venting properly. Furnaces that are over 20 years old will often begin to rust, despite proper ventilation and this can be an indication that it is time for a replacement. Ensuring that your furnace is venting properly is very important for the health of all those that live in your home. Even a small amount of exposure to combustion byproducts can cause flu-like symptoms, headaches, dizziness, nausea, fatigue and even heart palpitations and chronic bronchitis. One of the biggest indicators that your furnace isn’t venting properly is condensation on your windows. After the furnace comes on in the morning, the moisture will condense on the cold glass if it is venting into the house. A few other small things you can do to ensure your furnace is functioning properly are lubricate the furnace’s blower motor and remove all the dust from the air registers around your home. Most programmable digital thermostat have batteries and those should be changed over at least twice a year to keep everything communicating effectively. Enter to Win a Cryo Experience at Sparking Hill Resort and Spa! Cryrotherapy is a treatment which uses low temperatures to help decrease pain and inflammation and spasms in an affected area. The Cryo Cold Chamber Treatment at Sparking Hill is a signature wellness treatment with users spending up to three minutes in the room with the temperature set at -110°C. This treatment gives the nervous and circulatory systems a boost. TO ENTER! Leave us a Google Review and you will be entered to win! Leave a review for where you live: WEST KELOWNA or KELOWNA.